Impact with Insight Beyond Product™ | Jack B. Keenan Inc.
JBK has been in business in silicon valley now for more than 30 years, and given our experience, one of the more frequent questions we get asked is: “What’s changed in the sales training business?” Every time we hear that question our response is always the same …it’s the wrong question. The better question is: “What has changed in customer buying and decision-making processes?” We see three very powerful changes in customer buying behavior that have emerged slowly over the last few years – changes that will not likely reverse themselves. Information Asymmetry. First the asymmetry of company and product information that used to exist between us and the customer is so over. Not that many years ago, customers were largely dependent upon us for access to information about our company, our products and our solutions. Today, anyone with a browser and 30 minutes of free time can find out more about our company, and our products, faster and from more diverse perspectives than they will ever get from us. In fact, the research shows that customers facing a considered decision are often quite far down the path in their decision-making by the time they first engage with sales. Sales Relationship. Our own experience in silicon valley aligns with what many others have observed, i.e., customers are willing to spend less time engaging with sales people than in the past, likely due in part to #1 above. It would appear that customers have less time for the long lunches and dinners, golf and sports outings, and the other similar events that the prototypical relationship oriented sales people found so useful in the past. The research by the Corporate Executive Board that is summarized in their book, “The Challenger Sale”: Taking Control of the Customer Conversation” points up the somewhat startling realization that the relationship oriented sales rep of yesteryear is at a big disadvantage in most sales campaigns, and even more so when attempting to impact the more complex sales customer decisions. Differentiation Difficulties. In the flood of content marketing that exists today, the noise level in most every market is higher than it has ever been. Standing out – differentiating – in this flood is harder than ever. Customers consistently report that they have diffculty discerning the critical differences between solutions from different vendors, and even more importantly, what would be the impact of those differences on them and their situation. If is more diffcult for customers to discern differentiated advantages of your solutions – if alternatives appear to be relatively similar, on what do you think they will then base decisions? Price. So if customers are self-educating, are far down the path towards a decision before we meet them, and don’t want to spend as much time engaging us as they used to, what role does the sales representative play and what now is their value-add? We need to find an alternative to the old role of transporting product information from the company to the customer. We need to find ways to transform the way the customer views their situation – to change their perspective on it. And not to change it for the sake of changing it, but to do so in a way that helps a customer see the value of differentiated advantages that only we can bring to their situation. Lastly, we need to do this in a way that we can scale this efficiently across our different product lines, business units and sales regions. Simple to say, but hard to do. Which is why we built the Impact with Insight Beyond Product™ working session. 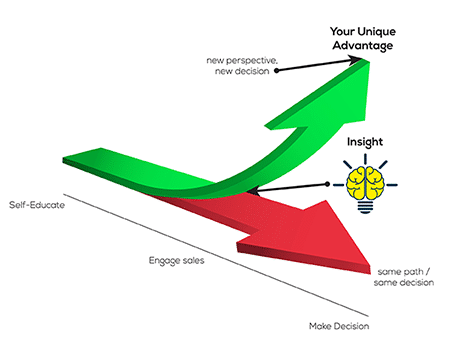 A clear understanding of what Insight Selling is, what it is not, and where the effort involved has the greatest payoff. Skills and strategies for answering The Core Question: What we firmly believe the customer is missing or getting wrong. A simple process for connecting insights to a Unique Advantage that we have relevant to the customer’s situation. 4-6 curated Insight Selling Messages captured in a format that can be told as third party stories by any member of the customer-facing team. A replicable process for sales and marketing to collaborate on the development of Insight Selling Story content. A strategy for tracking progress and capturing lessons learned. of our Impact with Insight Beyond the Product program fact sheet or contact us directly.